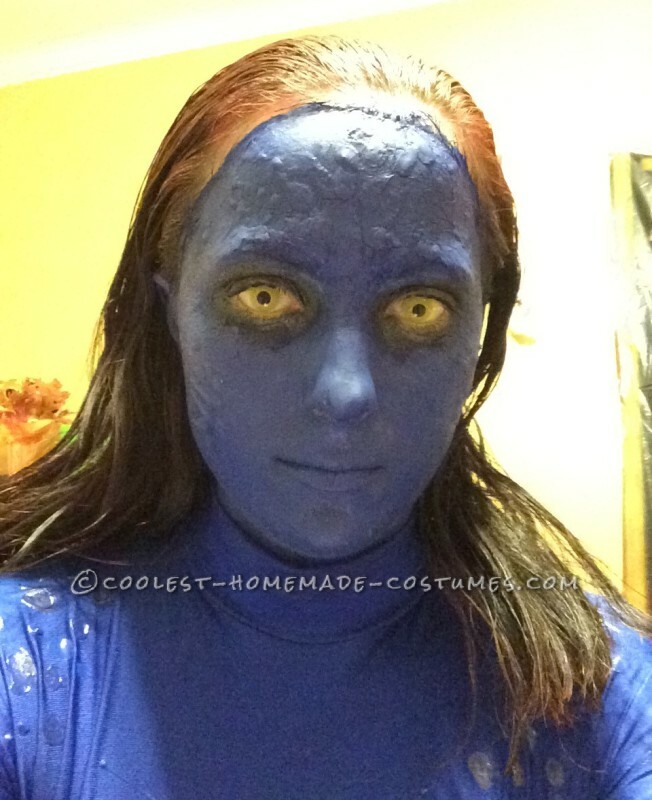 I’ve wanted to create this Mystique costume for a few years and finally researched it enough to take the time to do it! I ordered a custom made Marine Blue Lycra Spandex Catsuit from milanoo.com complete with hands and feet, which came to about $30 with delivery to me in Newfoundland, Canada. 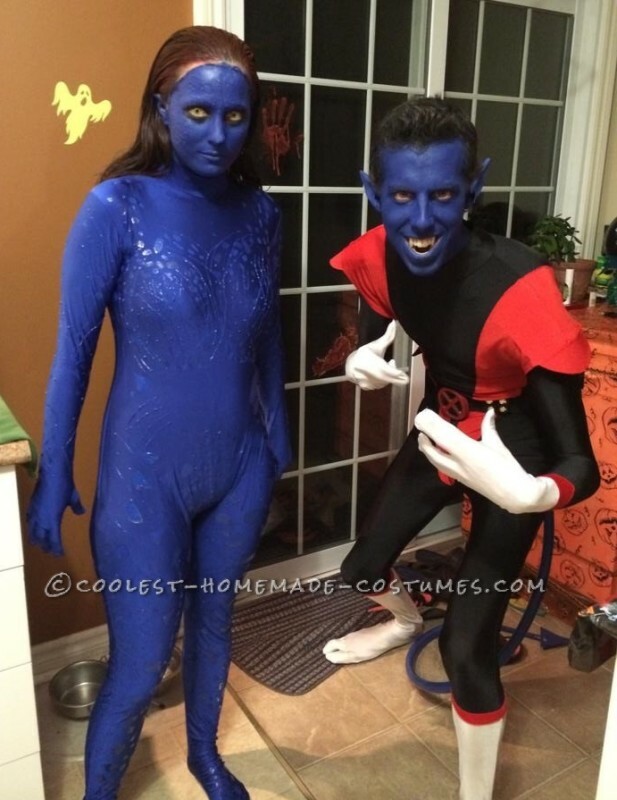 I looked at a lot of the homemade Mystique costumes on this site as well as any others I could find. After a bit of trial and error, I found that the best way to create the scales on the suit was by using a blue 3D fabric paint pen by Scribbles, and bottled 3D fabric paint, also by Scribbles. I found both of these at Walmart. I first started off by using only the pen but I had used it all by the time I did just the shins of the legs! The pens are pretty small and I had to buy it in a set of five (with only one pen being blue), so I knew I couldn’t just keep buying that. That’s when I decided to buy the bigger bottled paint as well, and I squirted it into the pen tube because I found it easier to draw with. They were different colors of blue but I found it looked really good. 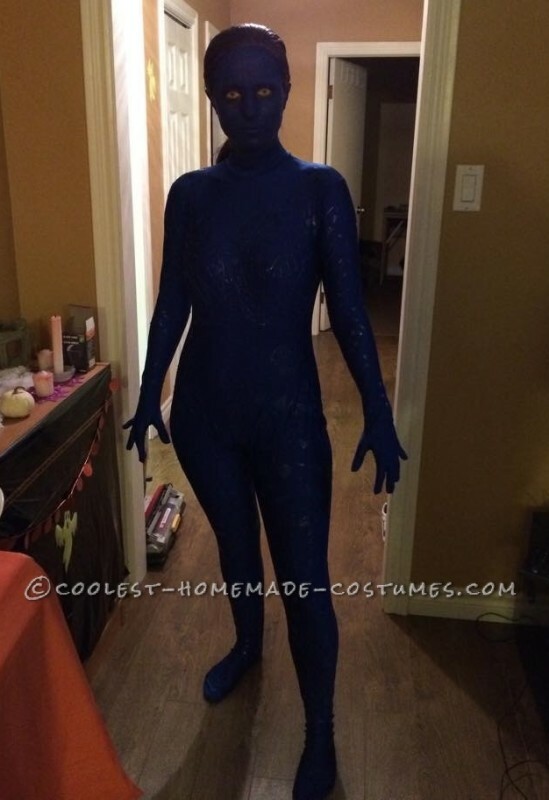 I made a lot of lines, triangles, and circles based on pictures I found online of Jennifer Lawrence’s Mystique and of other people’s costumes. The paint took about four hours to dry, so it took about a week in total of painting every day to complete the costume. I found the back of my costume looked a lot better than the front because I had already done the front by that point and any mistakes that I made, I wasn’t going to make again! So if I were to give any advice, it would be for you to do the back first because if you make any mistakes at least they aren’t in the front where most people see and take pictures of. For the face makeup, I followed a YouTube tutorial. 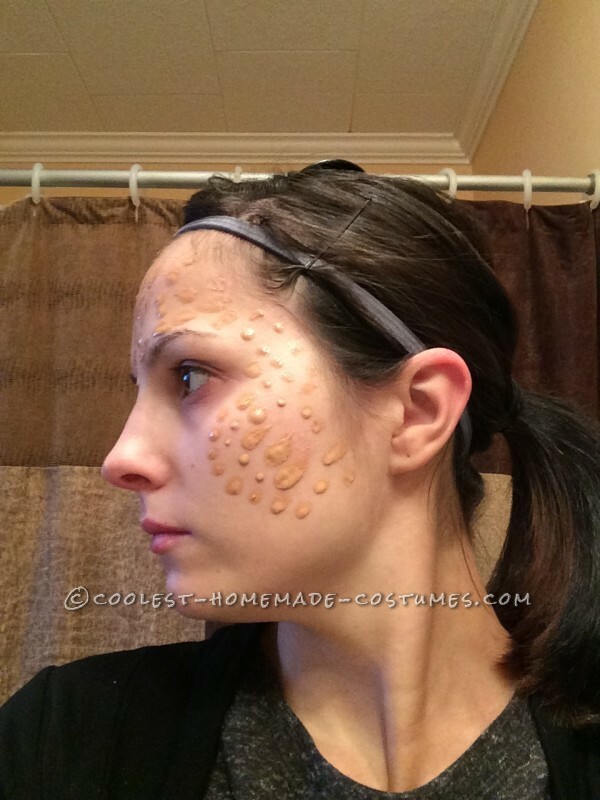 I used Mehron liquid latex to create the same scale pattern on my face, and it took about 15 minutes to dry completely. Make sure you have your hair back really well or it will get stuck in the latex! 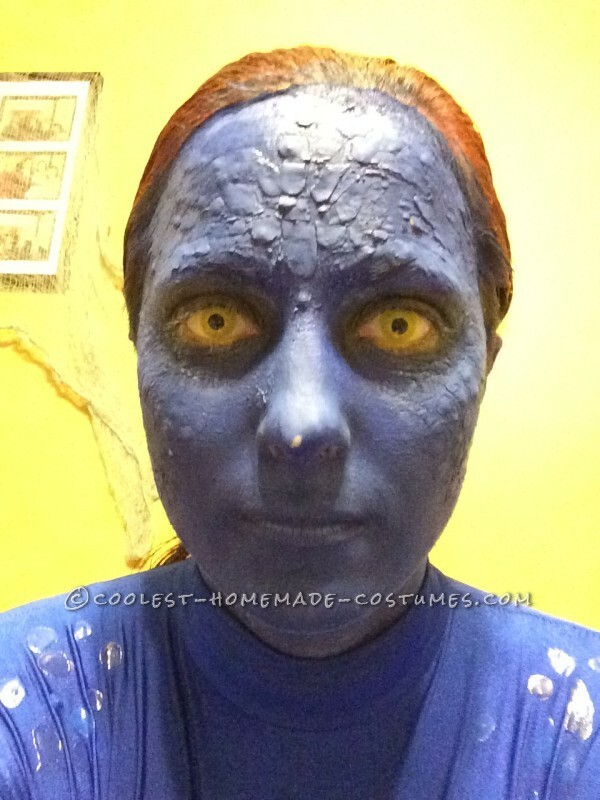 After the latex is dry, apply the blue cream makeup. I first used the same blue cream makeup that she does in the video, but I found that it got dry and cracked on my face, so I took some of it off and used Mehron Paradise Makeup AQ in dark blue on top of it. This made a huge difference and looked way better! 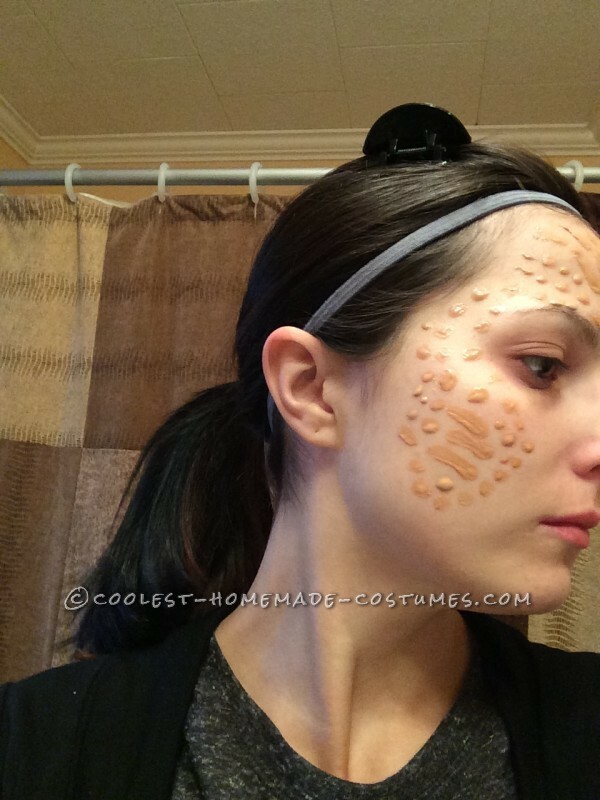 If I did this costume again, I would just use the Mehron paradise makeup. I tried using the same wet-n-wild makeup she did to highlight the scales but it didn’t work very well so I didn’t bother highlighting them. It didn’t end up making a difference because the scales showed really well through the blue makeup. The rest of the makeup was black eyeshadow on the eyes, mascara, and I bought a yellow eyeliner as well. The contacts I bought were prescription lenses from honeycolor.com in intense yellow. They looked pretty good for my dark brown eyes! I had initially ordered contacts from thedollyeye.com but they got lost in the mail, so I ended up getting a refund. Make sure you put the contacts in first, because it’s hard to do when you have makeup all over your face. For my hair, I used Manic Panic Dry Hard styling gel in Electric Lava. The color was great (I have dark brown hair) but if I had my time back I would just get red hairspray as I had to use two tubes of the gel and they cost $8 each at Shoppers Drug Mart (also sold at Walmart). It did work very well for slicking back my hair though. All in all, this was a very fun costume and I enjoyed creating it. Make sure you do your research because it is quite an undertaking, especially when you have to order things online and wait for delivery, like I had to do with the suit, contacts, and makeup I ordered. Everybody loved this costume and I’ll definitely wear it again! It’s my favorite! This costume is great! I am so happy to find someone who made it so well and explains it! Do you remember what size you ordered for the costume? Hi joannah your costume is so cool! I’m considering to get it. Just wish to check if there’s a zipper on it (where is it?) so that u can slip it on? Is the zipper hidden or can be seen? Pls advise thanks!